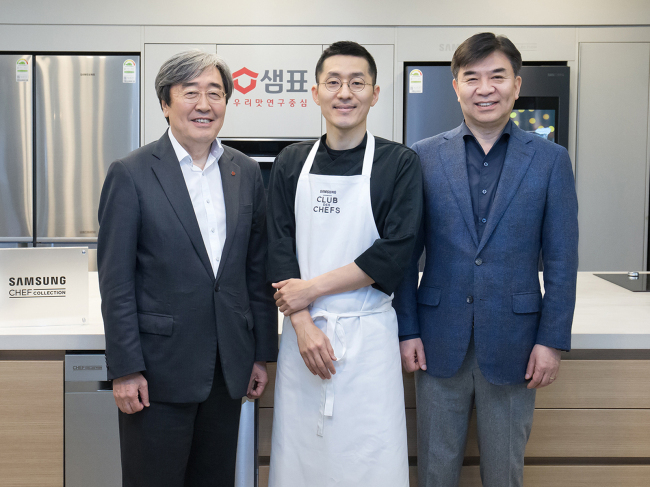 Samsung Electronics on Wednesday opened a cooking studio filled with its built-in appliances in partnership with local food company Sempio, announcing its expansion strategy for the 1 trillion won ($937 million) built-in market. Samsung said they will use the space to hold cooking classes and workshops on food culture in partnership with Sempio, offering consumers opportunities to experience Samsung products and understand Sempio’s vision to spread a healthier food culture. The partnership is also part of Samsung’s plan to strengthen its built-in appliances business this year, eyeing on the rising demand for built-in kitchens for luxury mansions, premium apartments and food businesses. The electronics giant will officially launch US-based built-in brand Dacor in the domestic market during the fourth quarter of this year for the first time since it acquired the company in 2016. Dacor will be the most premium built-in brand by Samsung, which will target needs from, for example, high-end town houses. Other mid-end built-in and premium brands like Chief Collection will also continue, the firm said. In Korea, there is growing demand for renovating kitchens at ordinary households by reflecting their lifestyles, the president said. “Kitchen, dining room and living room are becoming a single space where family members spend the most time at home, and how the space looks is becoming important in terms of people’s lifestyle,” Kim said. Some of the Dacor products will be modified to fit Koreans’ lifestyle, especially in terms of design to be contemporary, modern and minimal, the president said. “We are targeting Europe as the biggest built-in appliances market in the world as well,” he said.